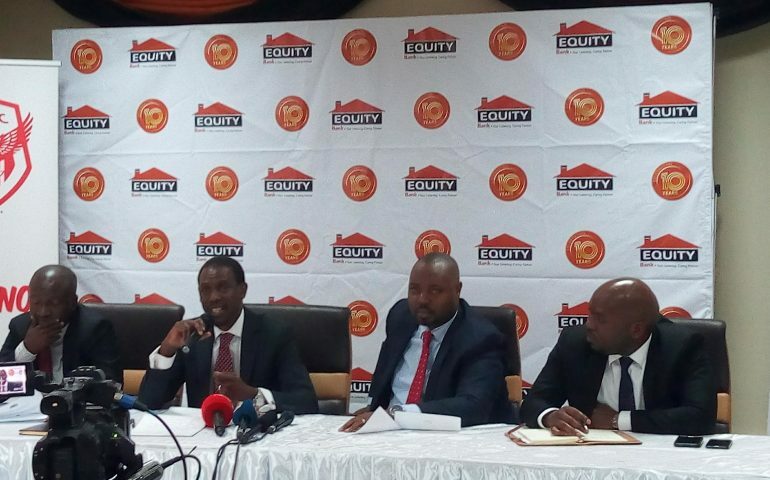 KAMPALA – Express FC looks to have started its road to stability after they signed a sponsorship deal with Equity Bank on Thursday morning. The Red Eagles who have struggled for years in terms of attracting sponsors have already started ripping dividends from the appointment of new Club Chairman Kiryowa Kiwanuka. Kiryowa, a grandson to club founder Jolly Joe Kiwanuka was announced as the new club head last week and he immediately promised to bring on board sponsors to the club. Speaking at a press briefing at the Bank’s head offices-Church House in Kampala, Equity’s Executive Director Anthony Kituuka said that his institution was pleased to partner with the Red Eagles. “We are pleased to partner with a club that has a sting heritage and is committed to empowering communities through Sports development, said Kituuka. “We have marked 10 years and better structured to serve all customers from all walks of life. “The bank has grown because of partnerships with organizations that have a lot of sentimental plans and clear development plans. “We want to build the club and its members. We have seen the return to order. Express FC is a very good avenue to build. “We are honored to announce a package of Shs 100 Million that will be invested into the club. The season long partnership also sees an introduction of the ‘Equity Express card’ that will be issued to club members and partners so as to access various services. The Equity Express card will go for Shs 50,000 and will be used to purchase tickets to watch all home matches. Speaking on the new partnership, Club Chairman Kiwanuka assured the Express family that they have started on their journey to recovery. “This is the partnership has been weighed and it’s fitting. Said Kiwanuka. “Fans will need to use the Equity Express Card for a cost of Shs 50,000 per season and it will be membership card for Express FC fans, continued the ‘savior’ as many of the Express fans have already started calling him. “I thank Equity Bank for the trust and confidence they have put in us but we seek discipline from all the fans. Stones and fights never score a goal. Express fans ought to embrace Equity. “If we perform well, then this partnership will be renewed. Details about the breakdown of the Sh100M were not revealed to the press. It is also believed that the club will unveil more sponsors in the coming weeks before the season starts.